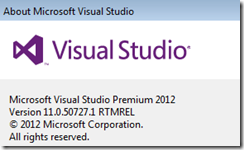 Microsoft has released another version of Visual Studio named Visual Studio 2012. As you can see there are user interface (UI) changes in all/most of the Microsoft applications as Microsoft is moving towards Windows 8 and changing the UI scheme for all of the applications. Visual Studio 2012 is a move to adapt the new interface requirements that are in coherent with Windows 8. 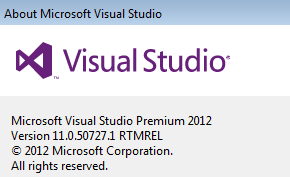 Not only this Visual Studio 2012 has lots of improvements in several areas and it supports .Net framework 4.5. In the past, whenever a new version of Visual Studio launches, developers needed to upgrade the project to new version of Visual Studio which was a pain, especially when you are working with a team of developers. Once a solution is upgraded to a newer version, it was not possible to going back. With Visual studio 2012, you can avoid the pain of upgrading. Developers will be able to open their project in Visual Studio 2012 along with Visual Studio 2010 SP 1. This means if you create a project using Visual Studio 2012, you will be able to open it with Visual Studio 2010 SP 1 and vice versa. There are some exceptions (as always!). 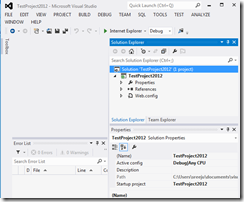 Visual Studio 2012 supports some new project types, which was not there in 2010 version. Such project, you will not be able to open in Visual Studio 2010. For e.g. Visual Studio 2012 brings a new project type named “Windows 8 Modern Applications”, such projects you will not be able to open using the 2010 version of Visual Studio. Just to prove the said subject, I am going to perform some simple operations. 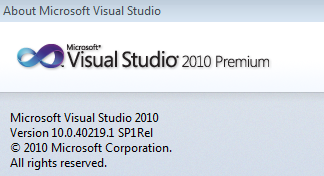 I installed Visual Studio 2010 with SP 1 and Visual Studio 2012 on my PC. See the snapshots for both the installations. Now I am going to perform two test cases. First create a project in 2010 Version and open it in 2012 version and vice versa. If you are interested, you can continue scrolling down, otherwise just say bye bye to this article. 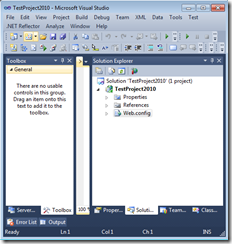 Case 1: Open a solution created using Visual Studio 2010 in 2012 version. 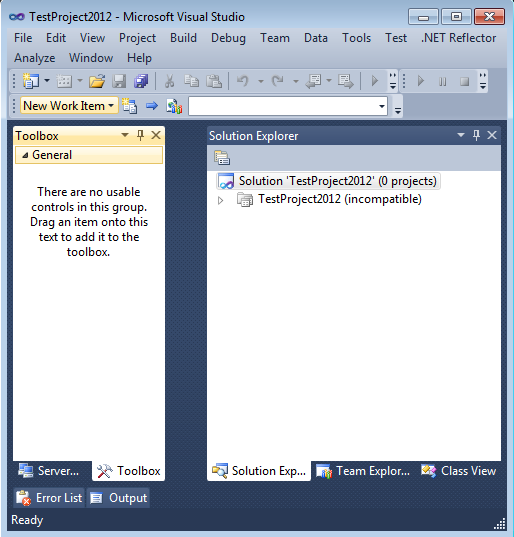 I created a project in VS 2010 named TestProject2010 using empty ASP.Net web application template. Once created the project appears in VS 2010 as follows. 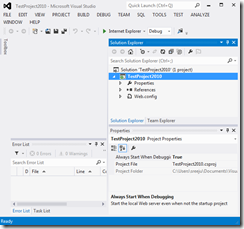 I closed Visual Studio and opened the solution file using VS 2012 by using the Open Project dialog(File -> Open Project/Solution). Surprisingly, there is not even a warning message, just the project opened fine in Visual Studio 2012. 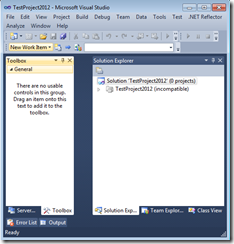 Case 2: Open a solution created using Visual Studio 2012 in 2010 version. 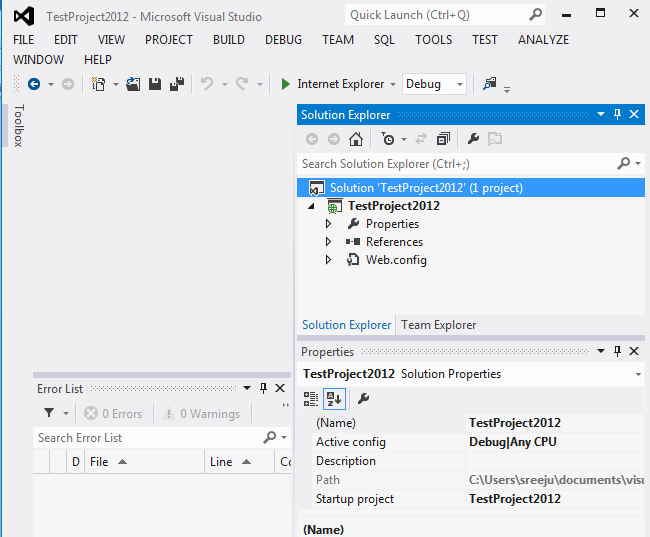 I have created a project in Visual Studio 2012 named testProject2012. 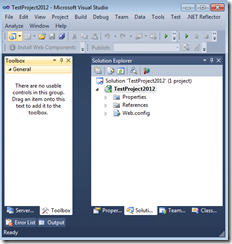 See the screenshot of the project in VS 2012 below. 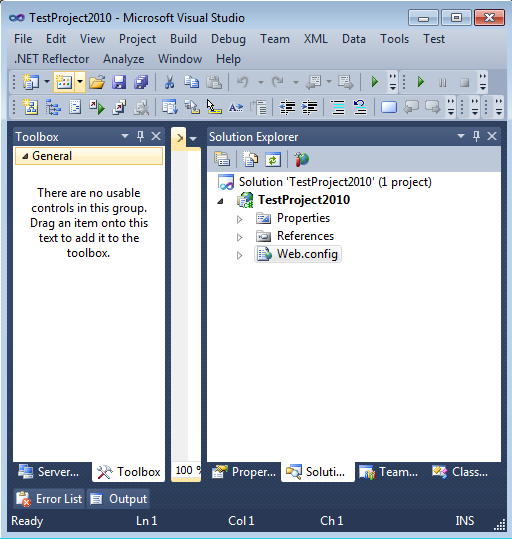 Now try opening the solution in Visual Studio 2010. 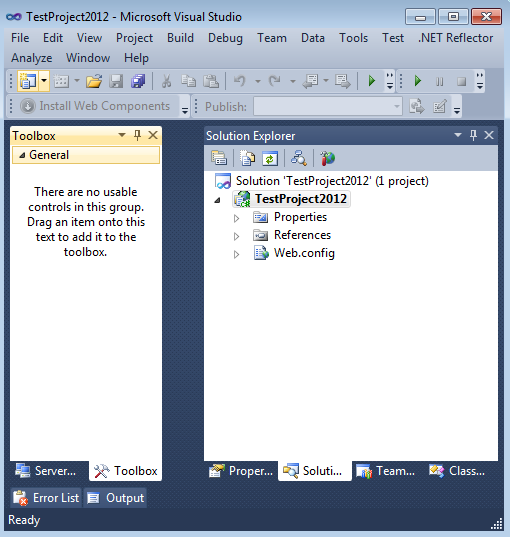 The solution loaded successfully, but Visual Studio failed to load project. See the screenshot. At first I was surprised. The Web application project template is available in both versions, So there should not be any problem. What is making the incompatibility? Is it ASP.Net version? Yes it is. VS 2012 assign ASP.Net 4.5 as the default version that was causing the trouble for Visual Studio 2010. 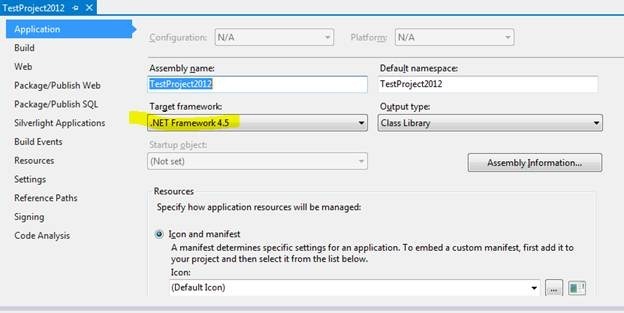 I changed the version to .Net framework 4.0 and saved the project after that I was able to open the project in Visual Studio 2010. This as an excellent move from Visual Studio Team and allows enterprises to perform gradual upgrade to the new version. 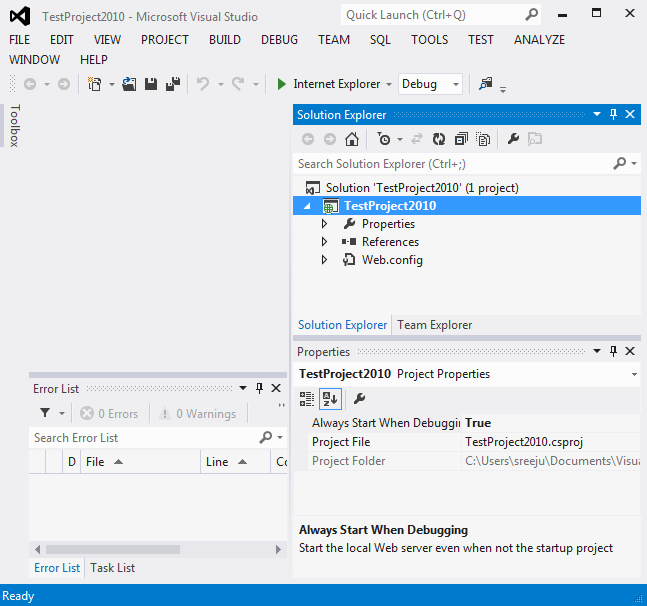 Now developers can work in any version based on availability and preference, simply I can use Visual Studio 2012 as my IDE while my colleague working on the same project can still use Visual Studio 2010. Helpful as I was considering whether they would coexist as I'm using some tools that are not VS 2012 yet and I wanted to build familiarity with the newer version. Thanks.